So you've received your plants in top condition from Aquarium Gardens, now what do you do? Many people who are new to aquarium plants wonder how to go about planting them in their aquarium. This step by step guide will advise how you should prepare your plants for planting in the aquarium. Plants from Aquarium Gardens are safe for use with all fish, shrimp and snails and can be added straight into your aquarium. There has not been any pesticides used in the production or holding of our plants, so there is no need to wash them under tap water nor is there a need to soak them in a bucket of water. Before adding any plants to your aquarium, remove the plastic pot and tear away the rockwool from the roots. The rockwool is used to cultivate the plants ready for your aquarium. Once the plant reaches your aquarium there is no need for the rock wool anymore. You can remove the rockwool by hand or by using a pair of planting tweezers to aid the process. You can now split the plant into several plants, using scissors for smaller, delicate plants such as Hemianthus Cuba. Plants such as Cryptocoryne and Echinodorus can be gently torn apart easily by hand. Depending on the plant you can get 3-6 plants from each pot. If the plant has large root structures, trim the roots down using a pair of scissors. 2-3cm of root length is fine. Trimming roots also encourages new healthy root growth which helps the plant get off to a great start in your aquarium. Remove any yellowing/dead leaves. This will ensure dead leaves do not decay inside your aquarium and encourages new leaf growth. 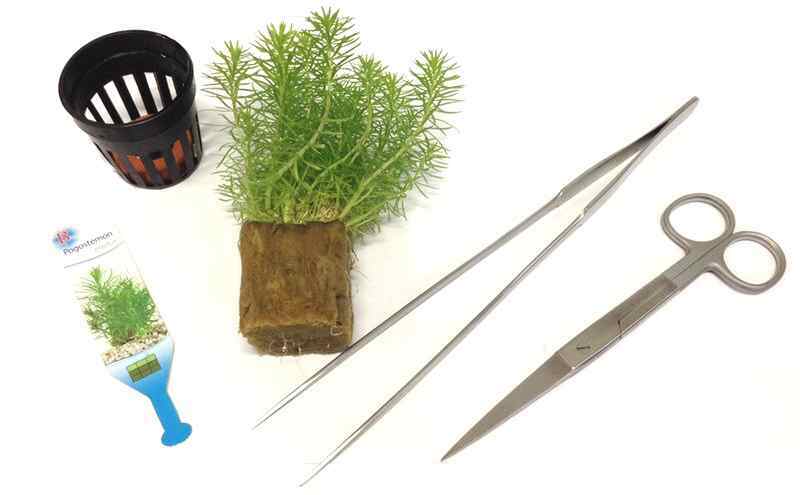 Lastly, push the plant into your substrate to bury the roots (using a pair of planting tweezers will help, especially with small fiddly plants). Give each plant room to grow by spacing plants out. For smaller plants, space them about 3-4cm apart. For larger plants such as Echinodorus, you may need to leave extra room as they can grow quite big. Now your plants are in, let them grow for 2-3 weeks before trimming them. They will take a while to adjust to there new surroundings. Focus on what they need to grow, mainly plant food, CO2 and a clean tank. Please see our other Plant Care Guides on our website for more detailed information and advise on growing plants. Top tip for newly planted aquariums: Have your lights on for no more than 6 hours per day for the first 3-4 weeks. This helps avoid algae outbreaks whilst your tank is yet to mature, brown algae usually strikes first and is a sign of too much light.